Everything you need for online shopping! we also offer coupons, gifting, customization, and more, as a part of the standard package! Add items up to a limit of 5,000 at no additional charge, or pay extra to raise your limit to up to 30,000 items. You'll be able to open up to 5 email accounts on our standard plan, or up to 100 on our deluxe plan. All personal and purchase data is encrypted with SSL, so you can rest easy knowing that your private information is secure. With our deluxe plan, you'll be able to add sub-administrators and select which store features they have access to. Manage orders from one convenient list, and easily send routine emails to your customers using our pre-designed email templates. Offer flat-rate shipping, or even choose different flat-rates for different regions of the world. Charge extra for refrigerated shipping, or offer free shipping above a certain threshold. You'll be able to easily manage customer information, and sort members into different membership levels with different perks. Go through one easy page to list new items, then manage them from a list where you can edit or delete them, or even copy them to create new items. Allow your customers to choose from a selection of different colors or sizes, and set different prices for different versions, or tell your customers when items are sold out. Open your shop to everyone, or close it when you want to overhaul its contents. In addition to such basic functions as the option to choose your delivery date and a range of payment options, we also offer unique functions, including the option to ship to multiple addresses. When opened on a smartphone, your webstore will be adjusted in width to make it ideal for mobile access. All menus and buttons will be optimized for maximum ease of use on a touchscreen. Upon listing an item on your PC site, it will immediately become available on your smartphone site with all the same item information. Your smartphone site is also customizable, with a wide array of pre-designed templates at your fingertips, and a CSS stylesheet for maximum customization. You can put Facebook "like" button etc, to your item page. You can also tweet your item information from the item page. You'll be able to cut prices for all items in your store, with the option to opt out for any items you don't want to discount. Allow your customers to sort items by category or subcategory, and even sort by product group, including color, size, and more. Issue discount coupons, and issue rewards points per unit of currency spent, which can be used for future purchases. Your customers will be able to save their favorite items, so they can buy them again and again. Allow your customers to customize their own orders with names, patterns, and more. Easily embed YouTube videos into your item pages and let everyone know how great your products are. Give your customers the option to have their orders gift-wrapped, and even choose from multiple wrapping options. Add questionnaires to the registration page to find out details about your customer base. Let your customers know what's happening in your store by sending customized HTML newsletters straight to your customers' email. Automatically recommend new items on the basis of your customers' purchase history or keywords entered. Display numerical grades (out of five stars) for your items, as well as reviews written by your customers. You even have the option to give a demographic breakdown to show which groups like a product the most. Help your customers remember the items they have recently checked out by displaying a list at the bottom of every page. With our multi-featured calendar, inform your customers of holidays, sales, when items will be back in stock, and other events, . Recommend or set items as new, and display them as such to your customers on the item list page. Talk to your customers, let them talk to each other, and even upload images in discussion of your store. Feature up to a hundred items, and rank them from first place to hundredth. Inform your customers about what's new in your store: new products, sales, holidays, and more. Customize your Welcome Page, or create new pages from scratch, to fulfill whatever purpose you desire. Set a minimum purchase threshold, or an upper limit on money spent on a single purchase. Let your customers know what's going on in your life by posting on your blog. Use a CSV file to register multiple items at once and easily edit their information. Easily upload, edit and delete your store's images using our Image Manager tool. For an additional fee, use FTP to upload large numbers of files at once. Combine text boxes, radio buttons, check boxes, and selection boxes to create fully customized forms to collect information from your customers. If someone is giving you trouble, put their email address, phone number or IP on your blacklist to notify you if they make a purchase on your shop. 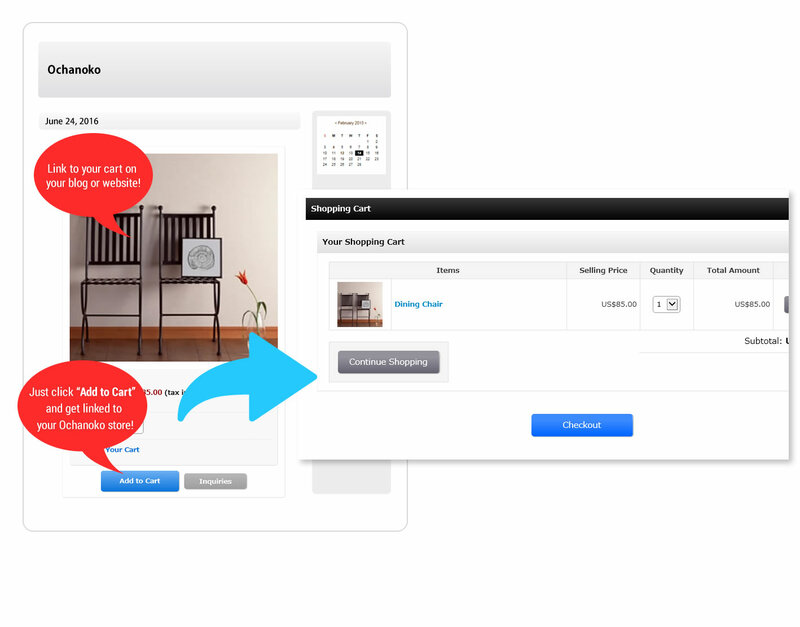 Set up sequences of automated emails to be sent after a customer registers or makes a purchase. Take advantage of our affiliate program: if you refer a new paying customer to Ochanoko, you will receive a commission. Select from more than 150 currencies from around the world, including dollars, pounds, euros, and yen. Serve customers around the world in English, or run your store in Japanese to focus specifically on establishing a customer base in Japan. The external cart function is property of Hands Inc., patented as No. 3883135. Firefox, Google Chrome　Updated versions required. Safari, Firefox, Google Chrome　Updated versions required.